According to Fortune Magazine, a Global Retail Theft Barometer study analyzed countries across the globe to determine that the U.S. has one of the highest rates of employee retail theft. Shrinkage is the term used to describe merchandise that, for lack of a better phrase, mysteriously vanishes. Some shrinkage may be due to lost or damaged items that do not make it into the inventory database of a particular store. U.S. retail stores have a total of $42 billion in losses per year. Consumers, not retail stores, pick up the bill; this accounts to $403 per U.S. household. However, much of these missing items are stolen, not damaged or lost in a database. Worldwide, 39 percent of shrinkage is caused by shoplifters, while 28 percent is due to employee theft. In the U.S., employees are responsible for causing 43 percent of that shrinkage. Theft from an employer also happens in the form of misuse of assets, embezzlement, and, of course, taking directly from a cash register, which is the most simple and easy way that workplace theft occurs. According to Static Brain, employees in the U.S. steal a total of $50 per year from their employers. Think again if you assume your employer will not press charges or seek punishment to the full extent of the law. First degree grand theft: property valued at $100,000 or more (first degree felony). 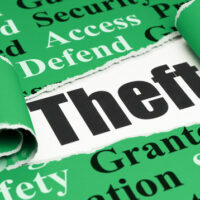 Have you been charged with stealing from your workplace? Do not expect to be treated lightly by your employer, even if you did not commit the crime. Because workplace theft is hands down the most damaging loss to retail stores and many other businesses, employers will seek the harshest penalties available and the prosecution will hold no punches. We strongly encourage you to work with an attorney no matter how small or large the theft allegations are. Grand theft of the third degree, which is a third degree felony, is punishable by up to five years in prison and a fine of $5,000, all for an alleged theft of an item as invaluable as $300. If you are facing criminal charges, seek help immediately. Call the West Palm Beach law offices of Skier Law Firm today at 561-820-1508.